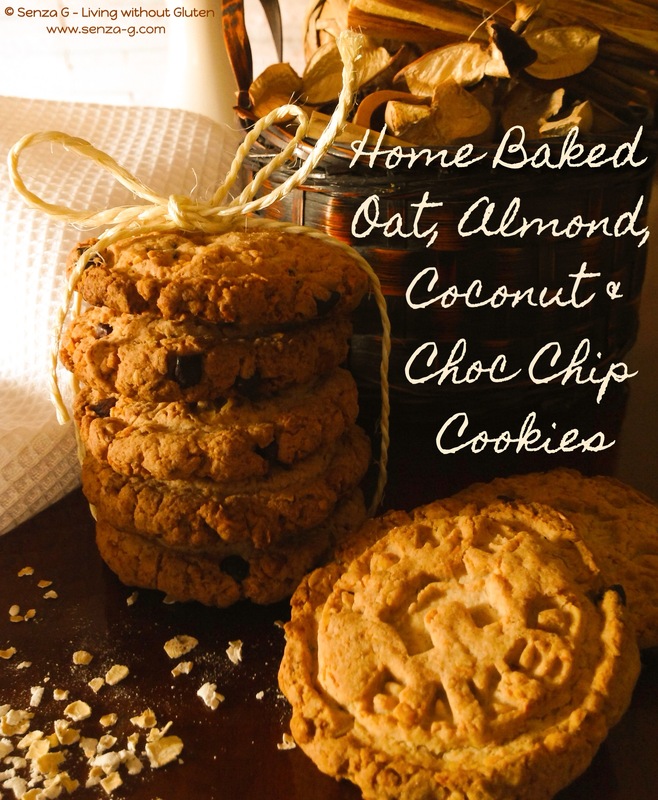 These are actually Coconut, Almond, Oatmeal and Chop Chip Cookies … but it does not fit in the window above! Cookies packed with so much goodness. I have made these repeatedly and they do not last more than a day they are so yummy! Makes 2 dozen cookies. Cream together the sugar and butter until smooth. Add the milk and vanilla essence and combine. In a separate bowl, whisk together the oats, sorghum flour, tapioca flour, potato starch, xanthan gum, baking powder, salt and baking soda. Add the dry ingredients to the wet and mix until just combined. Add the coconut, almonds and choc chips and blend until incorporated into the mix. Place rounded tablespoons on a greased cookie sheet and bake for 15 minutes. If you have a cookie stamp, press down on the cookies to create design.